Venezuela has the biggest known oil reserves in the world and an economy that is massively reliant on the exporting of that oil for its health. Approximately 90 per cent of government revenue comes from oil exports. That explains part of the reason why the country has struggled to cope with the 2014 fall in the oil price, with hyperinflation leading to massive shortages of food and medicines, and a mass exodus of Venezuelans from the country. The new sanctions on the state-run oil company PDVSA prevents the revenue of Venezuelan oil sales in the US (its biggest customer) from going to the Venezuelan government. Media reporting of the development has been widespread, including pieces in the BBC, The Guardian and the New York Times. Much of this coverage has focused on US President Donald Trump’s national security advisor, John Bolton, who appears to be leading the coup attempt from the US Government side. Bolton refused to rule out military intervention, saying that “all options are on the table”, and a picture of his notepad was taken which said “6,000 troops in Colombia” on it. What all of the reports fail to mention was Bolton’s remarks when speaking to Fox News about the issue, in which he was quite explicit about the gains to be made for US business from regime change in Venezuela. This quote can be found nowhere in the western press other than the Fox News video itself, despite the fact that it appears to be a clear statement revealing the motivation, or at least one of the motivations, behind US support for the coup. The BBC’s piece quotes Bolton in the second line to explain the new sanctions, but simply quotes his comment that Maduro and his allies can “no longer loot the assets of the Venezuelan people”, and further down the piece has another line from Bolton about how PDVSA is “corrupt”. This presents the US state’s intentions as entirely humanitarian and benign, despite Bolton making the remarks about the US benefiting commercially from Venezuela’s oil on the very same day. The BBC offers no alternative perspective - from Maduro or anyone else - as to why the US would be imposing the sanctions, nor the impact such sanctions could have on the Venezuelan people. The Guardian article leads on comments from Maduro saying the US wants Venezuela’s oil, but the article makes no link between Maduro’s remarks and those of Bolton’s, which one would think would be an obvious connection to make given the subject matter. The most detailed piece is in The New York Times, which explores almost every aspect of the sanctions, including the following line, which highlights the huge effect the sanctions are likely to have on ordinary Venezuelans, who are already suffering severe hardship. But, once again, the New York Times does not mention Bolton’s remarks to Fox News, and does not explore what the US’ motivation might be for these sanctions and the broader coup attempt. Beyond the missing Fox News quote, the three articles contain other omissions which are surely important in understanding US motives, the actual impact of sanctions on Venezuela and the historical background. US sanctions are actually already in place on Venezuela, and have had a devastating impact, making a major contribution to the current economic crisis. UN Rapporteur Alfred de Zayar, who last year became the first UN rapporteur to visit Venezuela for 21 years, described the US sanctions regime on Venezuela as “economic warfare” and recommended the International Criminal Court investigate economic sanctions against Venezuela as possible crimes against humanity. Curiously, Zayar’s remarks, based on his detailed report to the UN, do not make it into the BBC, The Guardian and NYT’s coverage. Venezuelan economist and long-time critic of the Maduro government has said the sanctions have been a major factor in the economy’s collapse. Arguing that “Venezuela’s economy has imploded because it cannot import”. If Bolton is right that the sanctions are aimed at helping the Venezuelan people, why are the BBC, The Guardian and New York Times not probing that claim given the track record of already existing sanctions on Venezuela? The BBC report contains a section titled ‘Why is Maduro so unpopular?’ but it fails to ask the question: Are the sanctions popular in Venezuela? A poll conducted by independent Venezuelan pollster Hinterlaces in January 2019 (before recent coup attempts begun) found 86 per cent would disagree with US military intervention and 81 per cent disagreed with US sanctions on Venezuela. While voxpops and quotes from Venezuelan citizens are widespread in the western media, this provides only anecdotal perspectives. Surely polling of what all Venezuelans think about sanctions is newsworthy? Another factor that has been consistently overlooked is the track record of the man leading this coup effort, John Bolton. There is almost no one else in US politics who has been more vociferous and unbending about his commitment to US intervention across the world, working in multiple roles in the Reagan and Bush junior administrations pushing his “war hawk” agenda before getting appointed by Donald Trump last April. He was instrumental in his advocacy for the Iraq war, and was accused by US Democratic congressman Henry Waxman of pushing the intelligence fabrications which led to the incorrect Iraqi weapons of mass destruction claims. 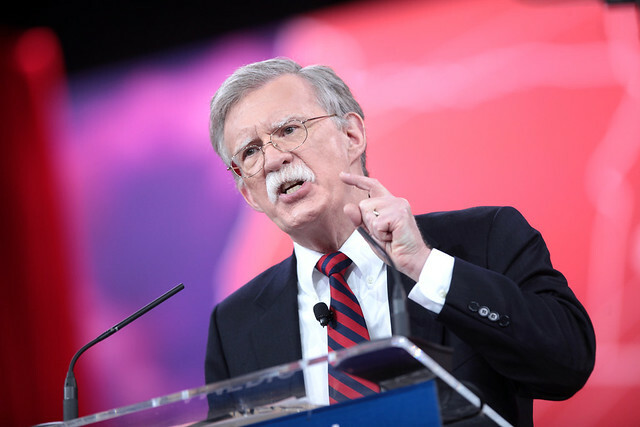 Bolton still defends the Iraq War to the hilt despite its disastrous aftermath, and has pushed for regime change in Iran, North Korea, Syria and Libya. When Trump appointed him, the media reported on his track record and warned that Bolton - in combination with the unpredictable President - could make for a dangerous double act. But none of that analysis has made it into coverage of the current Venezuela crisis, despite Bolton’s own statements which clearly show his eagerness to get US hands on Venezuelan oil, and Trump’s own track record of talking up the seizure of Iraqi oil. The imperialistic intent should be unavoidable for the press, and so should Bolton’s past endeavours – doubly so since the press got it so wrong in the run-up to the Iraq war. Indeed, it is remarkable that reporting of Venezuela can occur in such a historical vacuum, given the recent history of US intervention in the region. If this were, for example, Japan imposing sanctions and promoting a coup in China, it would be unthinkable that the media would not place such actions in the historical context of Japanese intervention in the country. Yet the historical record is missing from most reportage, despite Latin Americans knowing it only too well. There is not space here to cover it in detail, but Trump’s appointment last week of Elliot Abrams as US special envoy to Venezuela provides the perfect lens through the bloody history of US imperialism in its “backyard” can be viewed. Abrams was assistant secretary of state in the Reagan Administration in the 1980’s and was integral to its blood-soaked interventions in the region. He was accused by Amnesty International among others of covering up atrocities by US backed regimes in El Salvador, Honduras and Guatemala, and rebels in Nicaragua. Abrams described reports of the El Mozote massacre by the El Salvador regime as “not credible” in 1982. Eleven years later the Salvadoran Truth Commission found that 500 citizens were “deliberately and systematically executed” in the massacre. Abrams nonetheless defended Washington’s policy in El Salvador years later as a “fabulous achievement”. After Congress stopped funding the rebel Contras seeking to overthrow the Nicaraguan government, Abrams sought other means by which to finance them in their efforts. He was caught up in the Iran-Contra scandal, where US officials were caught secretly selling arms to Iran in order to finance the Contras in Nicaragua. This is the US’ history in the region - clandestine coup attempts and propping up of military dictators with the blood of their own citizens on their hands. Abrams should be an obvious link to this past - yet he barely features in Venezuelan reporting.